Not every digital marketer has a Coca-Cola ad budget. In fact, I’ve never worked with a client who could spend crazy amounts of money on persona and audience studies. But, it’s never bothered me much because I really don’t need big studies. I can get some good data for free in Google Analytics, and you can too. If you’re running Google campaigns on the Display Network to boost awareness of your brand, it’s likely you want to drive this traffic to your landing pages. The call to action (CTA) you choose for your ad can be critical because it’s the first interaction a visitor has with you, and helps set expectations for what they’ll encounter next. Below I’ve outlined a few tips I have for testing which call to action you should use in your display ads. You may find, for example, that the hard-sell “contact us” CTA isn’t what your prospects want to see right away, but you can actually use your analytics to determine if you should try a “chat with a specialist”, or even a “see plans and pricing” prompt instead of a “buy now”. If the final URL for your display campaigns is a landing page you already have live, see what current visitors like to do when they land on this page. Even if you have an idea of what the ideal CTA is based on your intent and current setup of the page, visitors can always surprise you with what plays out in reality. To see this information, check out the Landing Pages report in Google Analytics. Simply navigate to Behavior > Site content > Landing pages. When you find your landing page, you can view each conversion action a user has taken to see which one the majority typically prefers. If there are multiple actions a user can take on your landing page (like call you directly or fill out a form, for example), you can see in Google Ads what the best performing action actually is. And—if that landing page is being used in several different campaigns or ad groups—you can combine all the data to get a more accurate view of performance. This report can ultimately help inform more useful CTAs for your other pages, or the CTAs for particular ad groups’ display ads. Remember: Understand the Target Audience of Your Landing Page First! It is very easy to assume the top converting goal action (once you find it in GA) would be the best route to go in choosing your ad’s CTA. However, if you’re using the same landing page for multiple steps of your funnel, you might not be picking the best CTA for display this way. First-time visitors to your web properties may prefer higher-level, less commitment heavy actions, like signing up for a newsletter, whereas users who have interacted with your brand several times might be more likely to fill out your contact form. If you use one landing page to cover several audiences, make sure you’re finding the appropriate actions your target audience likes to do the best at each stage of engagement, and maybe consider using multiple landing pages and ads to address these different stages where necessary. You can get a closer look at this in Google Ads under the audience tab when you segment the data by conversion name. Let’s say you wanted to create an awareness campaign targeting users who match the Apparel & Accessories audience. How do you know what actions users in this category like to perform? A good way to find out is what they do on your site, and the answer can be found the same way as before in Google Analytics. 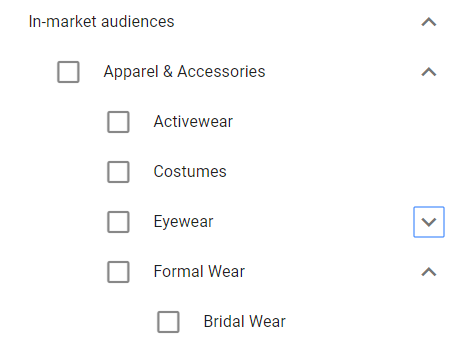 Every affinity and in-market audience breakout you can select in Google Ads for your display campaigns can be reviewed in Google Analytics in the Audience portion of the tool. You can review what targeting bucket your past visitors fall under, as well as how those audiences converted in the past. This is helpful as you may find certain segments behave differently and some might be especially valuable to your business over others. Using the image above, let’s say the Apparel & Accessories/Activewear segment converted the best. If we find out via this report that these visitors preferred to chat instead of submit a form, I’d likely choose a CTA for my display ads encouraging users to chat with a specialist (and have this reflected on the resulting landing page). 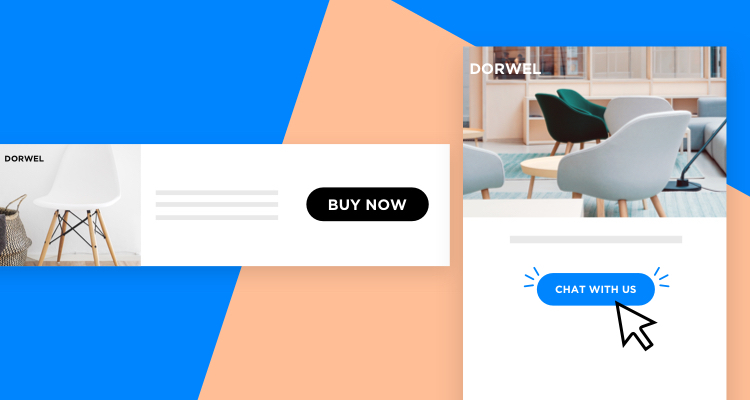 If you already have your target options picked out, this is a great way to confirm any of your already selected display ad CTAs are in line with what your chosen audience actually likes to do. There are a couple of websites I visit daily. Depending on where I am, I could be visiting those sites at home on my laptop or anywhere else from my phone. When I’m on those sites, I notice the ad placements differ a lot between each device type (I’m a nerd, and I pay attention to this stuff all the time). But keep this in mind when creating a display campaign. Ad placements and user behavior differs for each device. Here’s one example of the landing page report and how user behavior differed for one goal type when I was running a display campaign. We saw users on their phone didn’t want to fill out the form. Compared to those on desktop, they preferred to call or use the chat tool. If we didn’t segment out our data like this, it would have looked like the preferred CTA for this display campaign would have been to push form submissions no matter the device. Once we segmented the data, however, we realized we should switch up our mobile display ad message to lower the perceived friction to those using mobile devices. In this case we tested out a different mobile landing page prompting the mobile-friendly goal action instead of the form fill. Any experienced marketer should have the mentality of constant testing, and hopefully you’re already testing multiple sets of display ads. As I’ve shown today, let Google Analytics help make those testing decisions easier. For a head start on new campaigns, look at the data you already have from current campaigns and visitors to see what your audiences prefer to do on your landing pages. Use this data to craft the perfect CTA that will have the most impact on a potential new customer.